Once again, the oracular J.D. 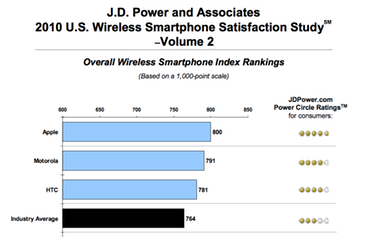 Power has dubbed Apple the king of the smartphone heap in terms of customer satisfaction. In its regular survey of satisfaction among owners of smartphones and traditional cellular phones, Apple topped the listing of smartphone manufacturers for the fourth consecutive time. The studies, conducted between January and June 2010, surveyed 6,821 smartphone owners and 11,803 traditional cell phone owners who’ve used their phones for less than two years. Rankings depended on performance in several key factors; for smartphones, those factors were—in order of importance—ease of operation, the operating system, physical design, features, and battery function. Apple scored 800 out of 1000 in the ranking; its closest competitors were Motorola and HTC, who scored 791 and 781 respectively. All three topped the industry average for smartphones of 754, below which you find manufacturers such as RIM (737), Samsung (735), Palm (726), and Nokia (711). Apple was down previously from its score of 811 in the firm’s last survey, but RIM took a far bigger hit, dropping to fourth, with Motorola and HTC surging upwards to fill the gap. Given that both of those companies have released a number of Android-powered smartphones this year, it’s not hard to point to that as a reason for much of their success. Other interesting finds in the survey include that the average price of cell phone plans has gone up, unsurprisingly, from $69 three years ago to $78 today, thanks largely to increased use of texting and the addition of data plans. However, consumers are also keeping their phones longer—an average of 20.5 months, up from 1999’s average of 17.3 months—to avoid the cost of buying a new handset or fees for switching providers. To nobody’s surprise, J.D. Power also reported that apps are a big deal on smartphones, with more than two-thirds of users downloading games, 54 percent using travel software like maps and weather, 41 percent downloading utilities, and 36 percent using business-specific programs. The firm also said that the Android, iOS, and webOS platforms all performed “particularly well” among operating systems measured, though it didn’t supply exact figures. It would seem that Apple’s on a roll, but we’ll have to wait six months or so to see if it can hold onto its title for the fifth straight time.